So, this is my favourite Lad, Lestat. He is so handsome! I made a tag this time. Look at this guy! Love him! The tag has a ton of glimmer mist on it so it shimmers but you can’t see it in the pictures as usual. Close up. 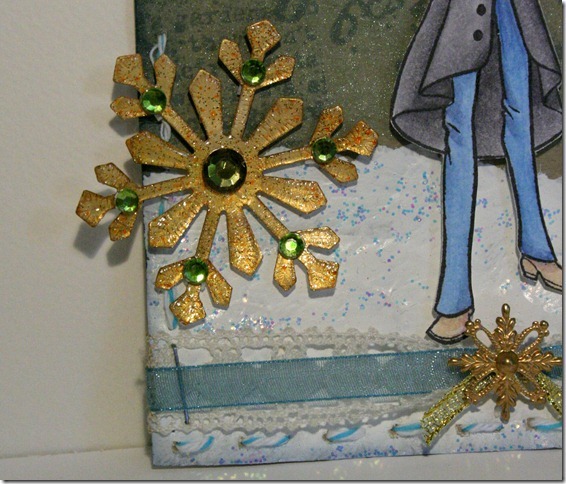 Here you can also see the snow, I’ve made it ith gesso and then some stickles on top. So, that’s the last of the Lil christmas stamps. You like? I LOVE! Hop on over to see the other creations made by the very talanted pink ladies in the Tickled Pink Stamps blog. Also, don’t be sad that there are no more Lil Lads and Lolitas right now. In a couple of days you can check out the new Pinkettes, they are super cute. But my work is done for now. 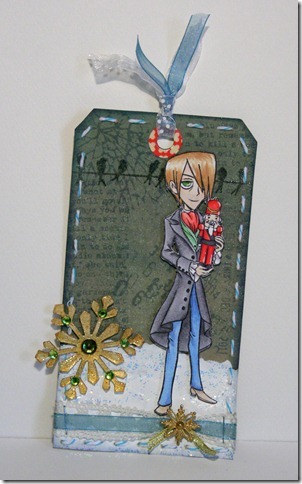 Dont forget to hop on over to the shop tomorrow to get your own set of Lil Christmas with sentiments to top it off. Get all you christmas cards done in time this year maby? helt underbara varelser här i denna blogg.. tror jag minsann blir följare av din blogg..